9ct yellow gold necklace, Aquamarine beads and florentine engraved spacers. 9ct yellow gold with Barouqe cultured freshwater pearls wrapped in textured gold. 18ct yellow gold open wire necklace set with 16 Aquamarines and Amethyst jacket cut stones. 9ct yellow gold necklace with white cultured freshwater pearls with tapered gold spacers. Gold and silver link necklace set with Turquoise beads. 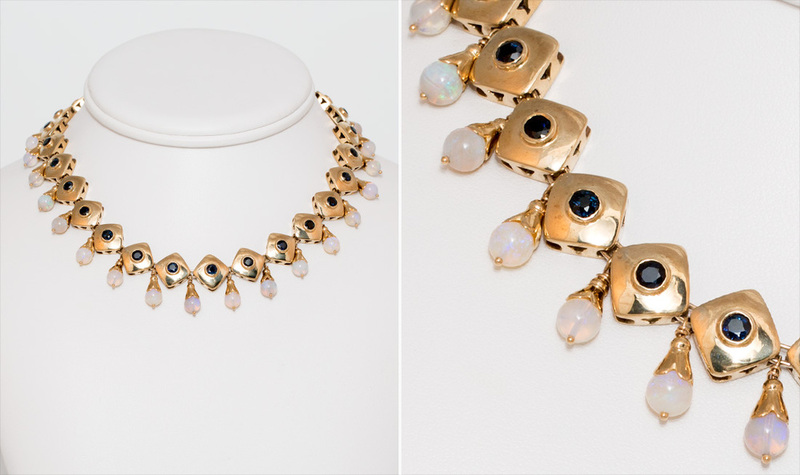 9ct yellow gold necklace set with Sapphires and Water Opal drops.